When I moved out of my parents house after college, I was excited about two things: living by the avenue in Hampden and decorating my new bedroom. This bedroom was just going to be occupied by me, so I really embraced all things pink. My lamps, my sheets, my blankets, paintings, pillows, benches, all of it was pink. We then learned that we were able to paint the walls. Since I was turning this room into my pink oasis, I painted my walls "tropical dream." But then my boyfriend and I decided to move in together and I realized that he may not appreciate pink as much as I did. I also realized that he needed a place to put his clothes, and my clothes were already spilling out of the closet. We just moved into our new loft apartment, and the majority of the pink went into the mudroom/closet/proof that I have too many clothes. The toughest part of neutralising the once-pink bedroom was my budget. I tired to go to pinterest for inspiration, but apparently I only pin things I could never afford. The first thing we did when redesigning our bedroom was decide what was going to stay. Luckily, I hadn't gotten my navy duvet cover monogrammed yet (apparently people don't like it when everything in their house, including all the wine glasses and coffee mugs, have somebody else's monogram on it). We also kept the bronze bed that was passed down from my mom and the bronze side tables. We also decided to swap mint for a darker emerald green to accent the navy and bronze items we were keeping. On to the swap: I said good bye to my pink Southern Tide sheets for a navy striped sheet set from West Elm. 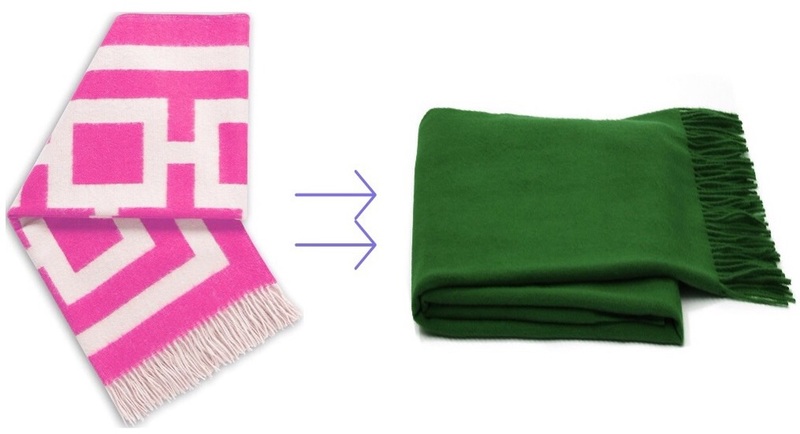 The hot pink blanket was moved to the living room in favor of a green cashmere throw. The "get it girl" pillow was very appropriately moved to my "you have too many clothes" room. I have been eyeing this palm pillow from Society Social for a while, so I was very excited when we decided to go with green. This is where it started to get hard. The best option was to get new lampshades, but the cords of the lamps are also hot pink. Instead of going from very pink to less pink, we opted for marble lamps from West Elm with brass accents. One Kings Lane is my favorite place to get furnishings. I got this painting off the app in the summer, and I got the mirror that took its place from OKL too. I use the chevron bench to store my sweaters in the summer and my bathing suits in the winter, so it made sense to move it with the rest of my clothes. A navy bench took its place at the end of my bed. My mint chair is actually my desk chair, and we didn't have room for the desk in our new bedroom. We do have room for a chair and a small side table, and this striped chair (also from OKL) is perfect. We can't paint the walls in our apartment, but if we ever can, I think this navy is dreamy. I'd love to do an accent wall with gray stripes. Dream catcher from Behr seems appropriate for the stripes. Lastly, we got a few new things to fill empty space. We got more throw pillows for the bed (you can never have enough pillows and throw blankets) and a table for the striped chair. Our apartment is a loft, so we have very high ceilings and 8-ft windows. While that's great, it came at the cost of zero overhead lighting. They figured if nobody could reach the ceilings to change light bulbs, why bother installing it. We quickly found that lamps are your best friend, especially in the winter when the sun sets before I even leave work, This brass lamp from Pottery barn is the perfect lamp disguised as a tabletop accessory. The final product is still coming together, but we will have a much less pink and much more neutral home. I finally have an apartment I absolutely adore. My living arrangements have been an adventure since I moved out of my parents after college. I had roommates who disappeared and mice that wouldn't go away (seriously, they were too smart for the mouse traps the exterminator put down. I even tried putting cheese and Reese's on them. Nothing). Part of what I love about my apartment are the high ceilings and huge windows. As soon as I moved in, I knew where our Christmas tree was going to go. As soon as the. Christmas season arrived, I put on my merriest red sweater, puffiest Lilly vest, and monogrammed sunnies, and I started looking for the perfect tree. It was a little windy. And that made it a little chilly. And that made me want to buy the first tree I saw (a beautiful 10 foot tree WITHOUT bald spots). It was fate. Luckily, I was able to get the 10 foot tree because I had a helper... possibly a slightly unwilling helper who thought a smaller tree would have been just fine. But clearly he was wrong. Look at him standing next to the tree we picked up for my parents! Too tiny! Only a 10 foot tree would do! And I was right. It's magnificent and fills our apartment with Christmas Cheer!